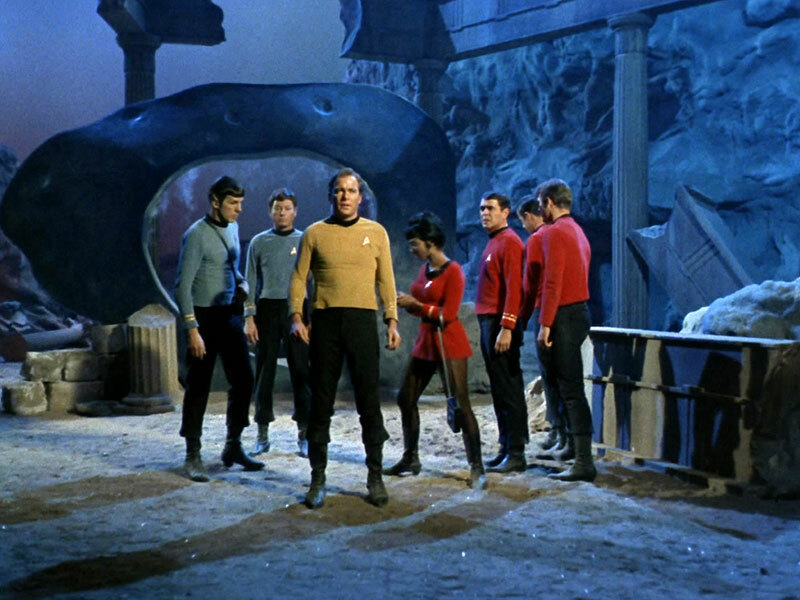 Star Trek TOS Episode “City on the Edge of Forever”, how many went down to the alien planet? For all intents and purposes the question that I pose is simple and to the point. Including McCoy as 1, how many people from the Enterprise beamed down to the alien planet. As seen in the below image, there are 2 redshirts, Scotty, Uhura, Kirk, McCoy and Spock. These are the ones specifically from the Enterprise. Kirk, Spock, Scott, Uhura, two security guards and Dr. McCoy. According to the 'script only the party of 6 beamed down, after McCoy. CHIEF [OC]: Captain, Doctor McCoy has beamed himself down to the planet. SPOCK: And the transporter at that time, Captain, was focused on the centre of the time disturbance. KIRK: So whatever's down there, McCoy is in the heart of it. Set up a landing party. Let's go get him. Kirk out. Memory Alpha identifies one of the security guards as Galloway, but in the 'script Galloway is last mentioned shortly before the party beams down, it was him who found the unconscious transport officer. GALLOWAY: Security 054, sir. We just found the transport chief injured. Why didn't search party get affected after McCoy altered past? Was the episode “This Side of Paradise” (Star Trek TOS) a critique of the hippy movement? How many alternate Star Trek timelines have been presented to us onscreen in the Franchise?